Pets of the Homeless shipping crates so homeless with pets can find help they need to get out of homelessness. 76% of homeless have a physical disability or a developmental disability or have HIV/AIDS or mental illness or a substance abuse problem. A pet brings comfort. Joe and Roxy are hoping they can find a bed for the night at a homeless shelter. They have just arrived in town after hitching a ride and walking fifty miles. 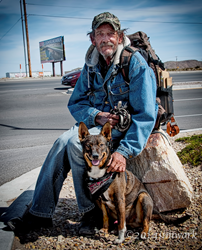 Roxy, Joe’s dog, is his constant companion and his lifeline. Joe is a veteran and one of the mentally ill who has ended up on the streets because the mental health system and the VA have failed him. About 10 million Americans have a serious mental illness and states across the country have cut funding. Joe finds the homeless shelter and soup kitchen by asking other street people where it is. Once there, he stands in a long line and then is turned away because of his dog Roxy. The shelter does not allow dogs. Joe won’t leave Roxy outside to fend for herself. Animal control may pick her up, and more importantly, he needs her for emotional and moral support to survive. Once again he will wander the streets of a new town. Joe finds a couple of other guys who tell him they sleep under the freeway bypass. He heads in that direction hoping to rest until it’s time to find food and water for Roxy and himelf. If the homeless shelter had allowed Joe and Roxy accommodations, he might have been able to talk to a social worker that could help him. He is eligible for disability and housing. But without help from a professional, one who knows how to navigate the system and use a computer, he will remain on the streets. Homeless shelters that allow pets are few and far between. A nonprofit called Pets of the Homeless is working to support shelters by shipping pet crates so companion pets can be allowed to stay by the side of their owners in a secure sleeping crate. The organization lists homeless shelters that allow pets on their website, but the list is short.